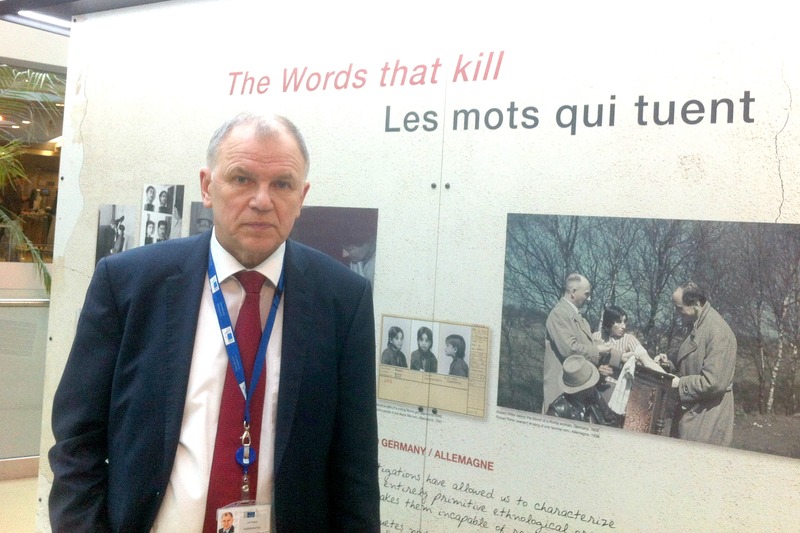 “I know what it means to be discriminated (against)… and when I hear anti-Semitic, anti-Islamic, and xenophobic speech, it’s like a bell ringing, telling people ‘Please be worried’,” Vytenis Andriukaitis told EURACTIV in an exclusive interview. Vytenis Andriukaitis, the Commissioner for Health and Food Safety, is a Lithuanian physician, politician, and co-signatory to the 1990 Act of the Re-Establishment of the State of Lithuania. Andriukaitis spoke to EURACTIV’s Senior Editor, Georgi Gotev. I noticed that you were among the few people taking the time to watch the exhibition dedicated to the history of Roma persecution and extermination during the Second World War, in the lobby of the Berlaymont. You yourself lived in the Gulag. What do these old photos and testimonies of the Roma genocide during World War II tell you? These pictures are not old. They show what genocide means. When today some people use very nationalistic words, when we hear so much hatred, xenophobia, different kinds of -phobias, I fear that we are on the same way. It’s very dangerous to play nationalistic games. The age of darkness which you mentioned was not long ago. And today you can hear a lot of ant-Semitic, anti-Islamic, xenophobic speech, which means we are not so far from similar disasters. For me it’s like a bell ringing, telling people “Please be worried”. Please remind us of your personal history during the Soviet Union. My personal history is maybe not so typical for the ordinary Soviet citizens. I was born in Stalin’s Gulag, in 1951, in a Gulag camp not far from Laptev Sea [a sea on the edge of the Arctic Ocean. It is located between the northern coast of Siberia, the Taimyr Peninsula, Severnaya Zemlya and the New Siberian Islands], on the Lena River delta, in the Polar Circle. The conditions were terrible. My father was arrested and deported in 1941 and was released in 1954, after Stalin’s death, when the Khrushchev period started, when we were given the right to move from Gulag to the continent, becoming “spetz-displaced persons”. There was such a status of “specially displaced persons”. But we were also called “враг народа”, in Russian, “enemy of the people”. I know what it means to be discriminated (against). How did you manage to become a doctor later on? After Khrushchev’s reform this was possible. The situation changed. Today a lot of people don’t understand the Soviet Union. Stalin’s Soviet Union was one thing, Khrushchev’s was another. Brezhnev’s, Gorbachev’s were completely different. People need to understand those changes in terms of real life, and (their) impact on society. I never was a Pioneer [the children’s Communist organisation] or a member of Komsomol [the Communist youth]. I was in the dissident movement. I was in the underground. But you succeeded in getting a good education. Yes, I studied very much, I had good grades. This helped me finish my studies at the Kaunas medical university [Kaunas is the second-largest city in Lithuania and has historically been a leading centre of Lithuanian economic, academic, and cultural life]. If you compare the Soviet Union of Nikita Khrushchev with today’s Russia, what would you say? You know, the Soviet Union is different from today’s Russia. And Russia had several stages of development – the first Yeltsin Russia, the second Yeltsin Russia, and then the period of the Putin-Medvedev tandem. We speak about Putin’s nationalism, but there is also Orbán’s nationalism, Kaczyхski’s nationalism, Landsbergis’ nationalism [Professor Vytautas Landsbergis is a Lithuanian conservative politician who was the first head of state of the post-Soviet Lithuania and is now member of the European Parliament]. It’s the same game with different nuances. But we should not call a regime by the name of the country. We should not say Russia, when you mean Putin’s nationalism. Russia is millions of people. We must use clear words. Many Russian people are excellent. They believe in freedom. This is why I think by using the name of the country instead of the name of the politician, we are feeding nationalism and hatred. We must stop doing that. For me, all nations are together, and I like very much the Russian people, the Polish people, the Hungarians, the Armenians… But when you see the political actors, you can debate, and of course, (and) some of them play dirty games. What needs to be debated is what needs to be done, that they stop playing dirty games. Many politicians from Eastern Europe, who suffered under Communism, became centre-right politicians. How come you became a Socialist? I was Socialist in the underground. In 1976 I established the first social democratic group, underground, in Kaunas. And I fought against Bolsheviks, against Stalinists, against Brezhnevists. I found your question strange. It’s a strange question, but I really wanted to ask it. I don’t quite see how he can be worried by anti-Nazi speech? (which basically is what anti-Islamic speech is). Maybe it is a symptom of xenofilia, which is just the deceptive mask of oikophobia, the true motivation of all traitors.